Second conclusion : with reasonable effort you can make a version that runs on every platform ( ok, not trying yet Windows phone, but it should not be so different – requires the browser to login). And you will find some implementation that parses the Web Json. Last time I authenticated the user within FourSquare use by running the browser.But it is not so good because you have no control over what the user does. So the application must authenticate within – and here comes the GUI with a WindowsForm( simple for me than WPF) and a WebBrowser control. Next time I will make a short review of what I have done. After successfully connecting to Foursquare with an Web application, the problem is what to don with a Desktop application. The most simple desktop application is a Console . The first idea that I have had is to start a browser, let the user pass his credentials and retrieve data from browser. The Console program open a web browser to the Foursquare web site with a redirect to http://fsq.apphb.com/ and GUID. The user enters his credentials to FourSquare site. Then Foursquare is redirecting to the http://fsq.apphb.com/ -and the http://fsq.apphb.com/ memorizes a GUID and his token. Then the Console reads from http://fsq.apphb.com/ the token ( has the GUID) and it is set. No parameterless constructor defined for type of ‘System.String’! watch the debug window and you will see the problems marked with !!! I wanted to do a tutorial for obtaining data from foursquare from Web , Desktop and mobile applications. I have made some research first and I have discovered the API and a library for obtaining data. “No parameterless constructor defined for type of ‘System.String’. I have made a custom code to see where the errors are. Now it is clear : icon is not a string, is a class! So just add a class with required properties , modify the property from string to this class and it is all solved! When obtaining data via HTTP API, just be sure that you can handle modifications! I have decided to log my daily routine from FourSquare . I decided to make a Web application and a desktop application ( console, to be easiear) . As a good application, 4Sq have an API at https://developer.foursquare.com/ . I suggest you to start with conecting to 4Sq, https://developer.foursquare.com/overview/auth . 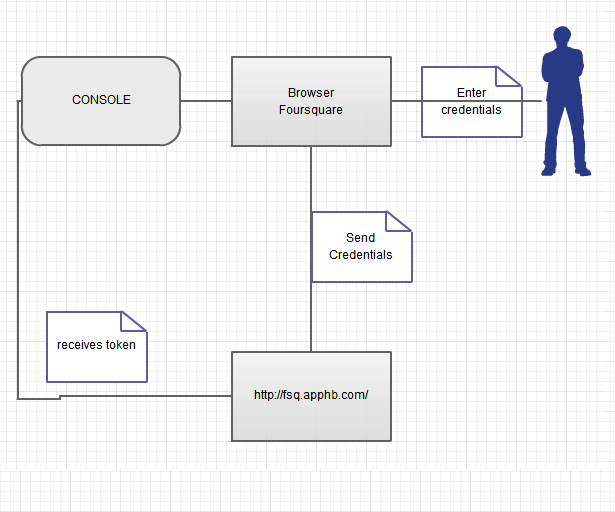 For WebServers , you will redirect the user to an URL from 4Sq. Then , with the code, you can ask for an access token and then you can search 4Sq API. You can see the application in work at http://fsq.apphb.com/ – just press the first “learn more” from the left. Now the real problem is to do the same thing from a DESKTOP application ( or Console, to be easier) – but this will be in the second part next week!